Aso Oke has been the top choice of those celebrating wedding in Yoruba traditional wedding style and even celebrities understands never to joke with it. Such is the case of Ayo Olukanni and Kehinde Adeife when they decides go down the aisle in an elegant traditional wedding which has become the trending fashion in town for the current age. Aso Oke has been part of Yoruba dressing from ancient time and anyone wearing these traditional attires whether peasants or lords is seen as being truly classy. However, Aso Oke as one of the top Yoruba traditional wedding dress for brides and grooms has taken new dimensions over time being one of the expensive traditional styles worn in the recent high class wedding across the country. Although, Aso Oke often consist of traditional clothing fabrics gotten in Nigeria, the designers of our time unlike their predecessors have advanced their skills in in making the cloth light on the skin in term of its weight and as well as producing varieties of colors combination and styles that gives elegant outlook in any Yoruba traditional wedding . The entries in this list feature the skills of these Nigerian celebrities in fashion especially in their choice of color combination which is soothing to the skin and appealing to the eyes that behold them. 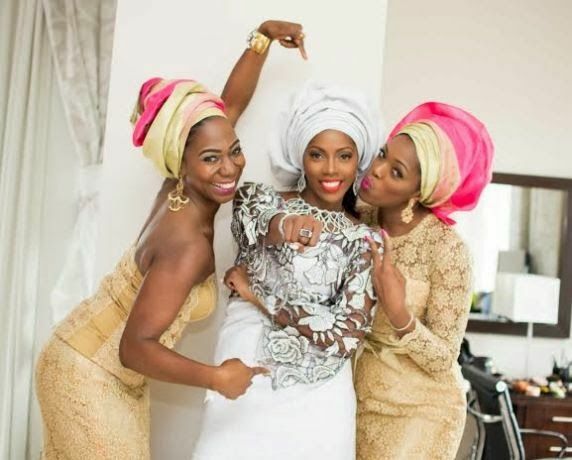 Here is the list top five Aso Oke used in Yoruba traditional wedding by celebrities. First celebrities who displayed classy style of Yoruba dressing in Aso Oke on this entry is one of our patrons, a realtor, human right activist and a leading youth politician from Osun State, Amb. Ayodeji Olukanni and his elegant bride, Engr. Kehinde Adeife, Director of Pregar Enterprise. The blend of light ash Aso Oke and the bride's deep ash color purse really pop against the bride's polished yellow skin. Didn't she look great? So, should you be contemplating your wedding ceremony in this new year, then this combo is a great choice. You'll look stunning and as well as your loving groom. Perharps, the only major thing that most people will remember Ebuka Oni-Uchedu for was not his TV personality but his mouth opening Agbada with unique Aso Oke style with which he shocked everyone at Adesua Etomi and Oluwabankole Wellington (AKA Banky W) Edo / Yoruba traditional wedding last year. Till now, this deconstructed agbada has been the major trending style for the groom’s men who want to reclaim the show of splendor that Ebuka did. Although, none of them will probably get the same media coverage that Ebuka got, but going for great color and out of the box design by their designer will definitely get anyone wearing this Aso Oke the attention that they deserve. One of that events that will continue to resonate in our minds is the stunning wore by the famous musician and Nollywood actor G -Fresh and and his bride in their traditional wedding at Osogbo early last year. The pink colored fila and gele blended so natural with the background theme and offer nothing but atmosphere of romance. No wonder G-Fresh hashtag on Instagram, #GBanks2018, on Instagram goes viral. You'll just love this Yoruba dressing style. Tiwa Salvage has always displayed expensive taste when it comes to choosing Yoruba dressing styles and in this entry, she show us what a true celebrity should look like in aso ebi with color blend to dazzle her fans. I bet you’ll want to get one Aso Oke style similar to hers. 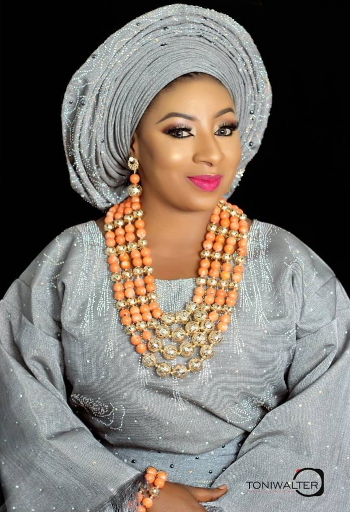 Although, we are all familiar with this gorgeous Nollywood artist, but one thing for sure is that we have never sighted her in is this kind of Aso Oke. This particular Aso ebi attire made her look more radiant and at peace. She justify the saying "…you can never go wrong with ash". The designer of his Yoruba traditional wedding attire, Fayar Concepts, gave much love to this design and look in this dress will continue to resonate in our mind for years.